You may have heard about Bakflip F1, which is widely considered as one of the best hard tonneau covers available on the market. However, you may have thrown that option away because of the demanding price. But there is still another option that may suit you better. Coming with the same low-profile design and easy installation, Bakflip G2 is the more affordable option for the consumer market. Despite not coming with some premium features, Bakflip G2 still has the same rugged construction that is ready to protect your items and belongings from criminals and the environment. Considering that Bakflip G2 is said to be very similar to the famous Bakflip F1, we are certainly wondering in what ways the two products are similar. Well, Bakflip G2 also has the same slim, low-profile design. When it is unfolded, you will not see any bulkiness that you usually expect from a hard tonneau cover. Bakflip G2 blends perfectly to the trunk of your truck, creating such an elegant unpronounced look. In addition, Bakflip G2 also has the same insulated EPS panel core that is reinforced by aircraft-grade aluminum panel frames and aluminum exterior. Hence, Bakflip G2 also offers superior durability against heavy impacts. 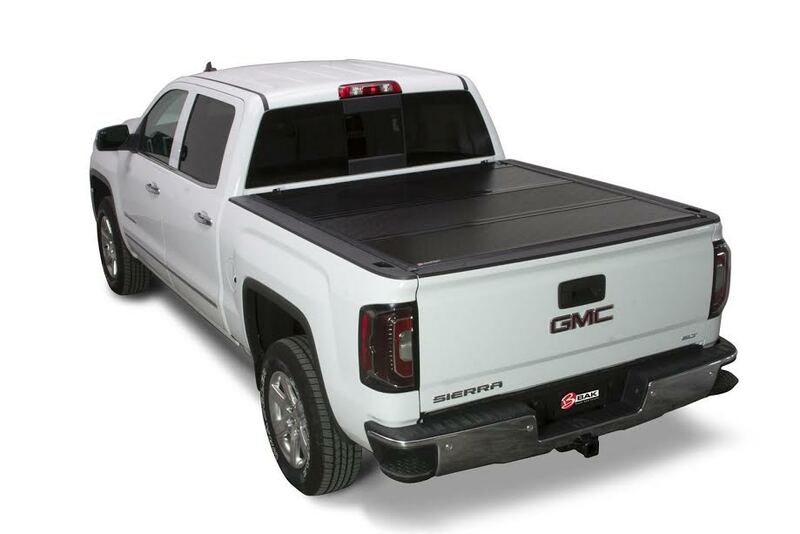 The hard tonneau cover consists of three panels, which are all foldable over 90 degrees. Bakflip G2 has been designed to have a one-way access from the rear part of the trunk, so it can’t open from the front. It is also very lightweight, and the protective layer on the surface provides resistance to sunlight. The hinges are made from corrosion-proof EPDM rubber, ensuring long-lasting usability and reliability. However, unlike Bakflip F1, Bakflip G2 does not have the fiberglass layer on the panels. As the effect, Bakflip G2 may be more prone to scratches and dents. But, if you want to prioritize protection against weather conditions and cost efficiency, then Bakflip G2 should be sufficient. The installation process is very easy and simple. With the clamp-on design, you only need a single 15 mm wrench to install the hard tonneau cover on the back of your truck from start to finish. The installation process can be finished fairly quickly. Make sure that you don’t wash the cover with a wax or wax-containing product because such action will damage the protective layer of the panels. Just use regular soap and water, and you are good to go. Check the best price of Bakflip G2 here!